I have fallen off my Scrapbook Thursday bandwagon. The next few weeks are an effort to get back on the wagon and to scrap the growing pile of pictures! 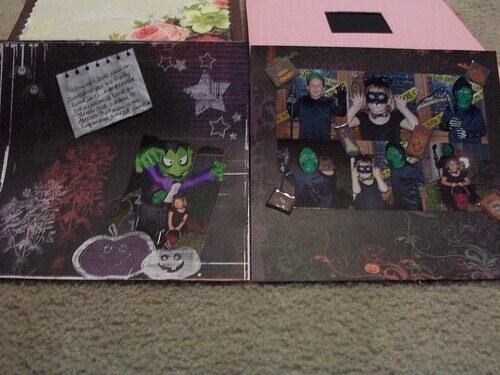 I only scrapbook when the mood hits me and I only scrapbook what I want to. Therefore I am often all over the place with what I am scrapbooking. I used to try and force myself to go in chronological order but I've decided it's not worth it as I'm usually not happy with the layouts and I end up scrapping nothing instead of something. Sometimes I go back to skipped pictures. Sometimes they just get left out, but I'm ok with that. The photos don't go away there just isn't a page in the scrpabook for them. 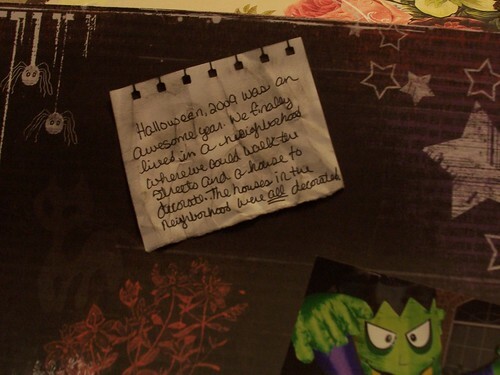 My all over the place method to scrapbooking is how I ended up doing Halloween pictures recently. I'm not sure of the papers. I know the right side of the layout is Little Yellow Bicycle but I'm not sure about the left side. The stickers in the corners of the pictures are by Rusty Pickle. I am so sad they are no longer in business. I loved their products.